When you picture a piggy bank you’re probably not thinking about your bones, but maybe you should be. Throughout childhood and adolescence our bodies are building the bone stores that we’ll need to last a lifetime. If we miss out on key bone building nutrients during these years, we enter adulthood with inadequate reserves. Once we’re adults, the focus is on maintaining the stores we have, which is a challenge itself since this too requires proper nutrition and sufficient bone building activity. Imagine the consequences if our bank account is low—as we enter adulthood it continues to dwindle moving forward. According to The National Osteoporosis Foundation, an estimated 54 million U.S adults are at risk for osteoporosis and low bone mass. That means more than one-half of the U.S. adult population over age 50 is at risk of breaking a bone and should be concerned about bone health. This also means parents want to be focused on helping kids boost their bone bank accounts during the developmental years. The National Institutes of Health suggests we think of our bones as a bank account and strive to consume abundant bone-building nutrients and get plenty of physical activity. While most of us naturally think of calcium in connection with bone health, it is worth pointing out that the body must have sufficient vitamin D to absorb that calcium, and that protein and phosphorus are equally critical to bone density. 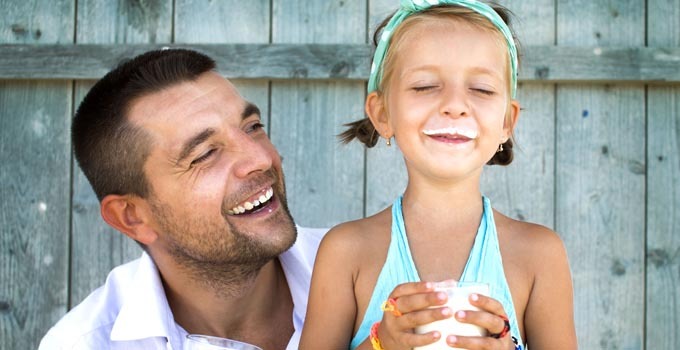 Thus, it’s not surprising that dairy foods are the perfect way to promote the integrity of our bones, since dairy foods, like milk, cheese and yogurt, are the top food source of both calcium and vitamin D in the diets of children and adults, and also contain high-quality protein and significant amounts of potassium and phosphorus. Dairy really does give you the most bang for your bone-building buck! How will you boost your bone bank account? Check out these kid-friendly recipes.